Photograph of a lead plate discovered at the confluence of the Kanawha and Ohio Rivers near Gallipolis, Ohio and Point Pleasant, West Virginia. The plates were buried by French explorer Joseph Pierre Celoron de Bienville and his scouting party in 1749. 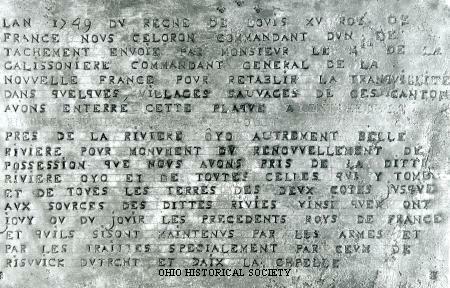 The plate's inscriptions are in French and claim King Louis the XV of	France the ruler of the Ohio Valley region. This plate was part of a group of plates placed near strategic tributaries of the Ohio River by Celoron and his party. The expedition and the ceremonies conducted when the plates were buried was intended as a show of force and an attempt to reclaim land for France on which British settlers were encroaching. The Ohio History Connection SC 1323, AL04493 from the Celeron Lead Plates Collection.